The Myth of the Free Day – Tamara Shazam! I gained 9 pounds over Halloween weekend. Nine flipping pounds. NINE!. I’m obese again. I weigh 210! I’m writing this all with a grin on my face, laughing at the silliness of it all. To be clear, I’m not worried. I’m incredulous, though! Nine pounds? Are you kidding me?!? I ate chili all weekend, which is essentially bean and onion soup, a little birthday cake, two beers and ten fun sized candy bars of assorted varieties… Lots of grapes, fresh veggies… I ran a few miles… And I gained nine pounds! I have to say, it didn’t feel worthy of nine pounds! I watch fat loss shows like crazy. I love watching the fast weightloss progress made by those people on The Biggest Loser or Extreme Makeover: Weightloss Edition. I use them when I’m working out or when I’m feeling a little low and need some external motivators to help kick start me into a loss cycle again. They often employ a strategy of a free day. Apparently, free day is a lazy day, often a Sunday, when the participant can cut loose a little, eat the foods they love and miss and not exercise. I’ll admit that ten fun size bars and two beers is a pretty big binge, but nine pounds?!?! For me, there is no off day. I need to be on point all the time. I need to be a careful eater, always. I can also point this out: this came at the end of a long, slow slide down. 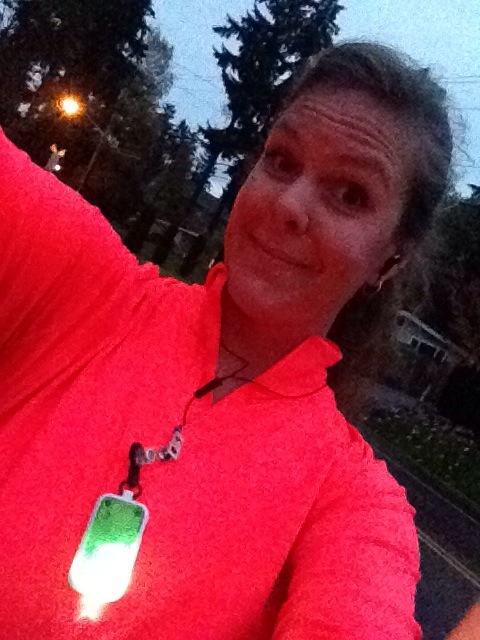 I was having a hard time getting out to run: it was too cold/wet/dark/hard of a day to make myself hit the pavement, so I was only running twice a week. Granted, I was running longer distances, but I wasn’t getting the consistent burn. To top it off with a Halloween candy binge was just too much; something had to give, so my stomach did! The good thing is that I find that a quick gain is often a quick turn around to a loss if I get right on it. So I’ve gotten right on it and have started running every day, in the dark, in the rain, with reflectors, neon and flashing lights as I run down the streets. It feels good. I feel alive, again, all of the sudden. I feel like running, and life is so much fun when I am in the mood to run!